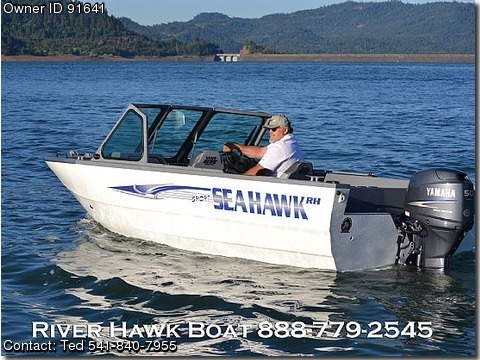 2012 16’ Sea Hawk Sport by River Hawk Boats $18,995.00 Buy new for the price of used. Your choice Yamaha or Mercury 50 hp outboard w/all welded galvanized trailer 3 bow Top Gun canvas top just $18,995.00 Industry Leading Extrusion free all-welded heavy gauge aluminum hull, Stronger yet Lighter Technologically advanced production techniques that provide a hull that is Pre-Stressed to deliver unparalleled strength & weight savings. This way of hull fabrication has been tested by the founder of the company to speeds in excess of 125 MPH using over a 1000HP. There is no boat available today that is stronger & safer than a River Hawk.